Moonfruit is one of the oldest website builders on the web. It’s a typical drag-and-drop site builder that requires no prior coding experience to create beautiful, functional websites. It’s fast, easy-to-use and rather affordable. Moonfruit is a UK-based company, founded in 2000. It started from Flash but when the advantages of HTML5 became obvious, the company moved towards the new technology. The shift was very successful. Moonfruit is really easy-to-use. If you have a rudimentary knowledge of web applications, you’re more than capable of creating a website with this web service. Simply drag the desired object to the canvas and place it wherever you want. Double-click it to make further changes. Moonfruit also has a quite decent e-commerce platform. It lets you easily sell your products/services online, even within the free Moonfruit plan. The builder also has its own blogging engine, so if you plan to start a blog, Moonfruit can be a great solution. There’s no way to change your current website template (this is mainly because the builder is backed by the editor based on the ‘absolute positioning’ concept where you can add widgets and content anywhere on the page). Also, Moonfruit doesn’t let users tweak the code of their website. Moonfruit is a great option for small businesses, online shops (I’ve seen dozens of cozy handmade shops created with Moonfruit) and blogs. Photographers, designers and stylists can also benefit from it. 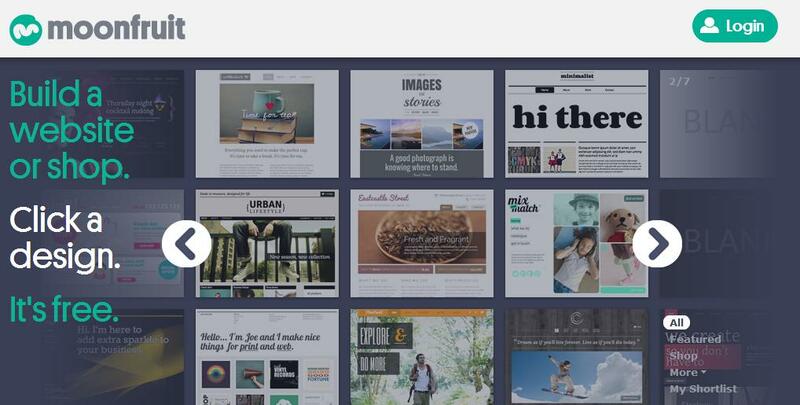 Moonfruit allows you to create one website with 15 pages for free. You can also choose among 4 paid packages, ranging from $6 to $35/mo. As I see it, Moonfruit is one of the best solutions for small business out there. It’s simple, affordable and fast. You know what, check it out yourself 😉 .